This book is the second in a global trilogy looking at the unreported Sikh diaspora comprising mainly the non-English speaking countries. The first one in the Sikh Global Village series was Sikhs in Latin America published by Manohar. 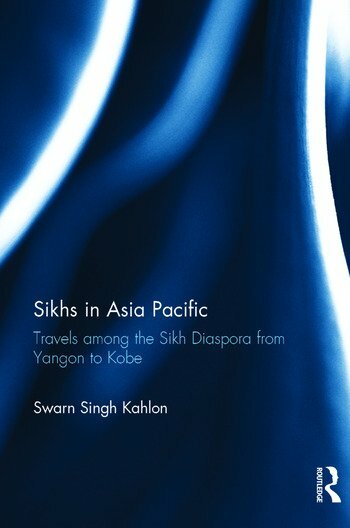 This volume covers Sikhs in Asia Pacific countries. The third will be on Sikhs in Europe. The Asia Pacific region is a vital and under-recognized home for the Sikh diaspora. Before 1947, most Sikhs migrated East. In addition to the commonly known destinations, the author also examines lesser known cases of Sikh migration to China, Korea, Japan and the Philippines. The book covers various aspects of the diaspora including the history of migration relating to the British Indian Army police force. The British gave preference in recruiting Sikhs, and encouraged them to build gurdwaras and supported them to keep their Sikh identity. Soon after arrival, these early immigrants encouraged their village compatriots and relatives to migrate in large numbers to avail of the various opportunities for gainful employment or business. Not only is this wave of migration important in its own right, but Sikh migration to North America finds its origins in the Asia-Pacific Sikh diaspora, specifically from Shanghai. The decolonization of Asian countries slowed down the migration and in some cases resulted even in exodus of Indians/Sikhs at the same time as new destinations to North America and UK opened up. Migration to each country has a unique profile, traced vividly in the book. Additionally the author has made an effort to outline the similarities and differences in migration of Sikhs to the East against present migration to the West. Case studies are extensively used. Swarn Singh Kahlon (www.sikhglobalvillage.com) has returned to Chandigarh after almost forty-five years, first studying Engineering in Bihar and the USA and then working in the USA, Austria, Mumbai and Kolkata. His career of thirty years with Imperial Chemical Industries involved extensive travel overseas. Over the last decade, he has been travelling extensively in an effort to complete the global migration map of Sikhs. He has visited 73 countries so far and is on his 24th passport.